I recently started using the Emani mineral makeup (foundation, eye shadow and blush) to see if I liked it compared to Bare Escentuals. I love the mineral makeups because they are free of irritants and harmful dyes, aren't tested on animals, pore friendly, and include a natural SPF. I was actually surprised when I started using the Emani Powder Foundation in the vanilla shade as I've never used foundation before. I had been using the Bare Escentuals Bisque, but the coverage wasn't all that good. With the Emani Foundation I get great coverage all over (plus when a little extra is needed for those occasional breakouts). For my blush, I've been using the Emani Crushed Mineral Cheek Color in Panama Mama (a little on the brush goes a long way and looks like natural rosy cheeks). For my eyes I've been applying the Emani Crushed Minerals Color Dust in White Gold directly under my eyebrows for that highlighted lift. I then apply Emani Crushed Minerals Color Dust in Ubanized to the eyelid and then with another brand of eyeshadow in black, I lightly line the bottom of my eyelid near my lashes and darken the outer edge of my eyelid. Then I apply my eyeliner. The nice thing about the Emani eyehadow is that it is definitely noticeable, but not at all heavy and looks very natural. I saw on the PlanetBeauty.com web site they compare Emani to M.A.C., Bobbie Brown, Stila and Benefit. 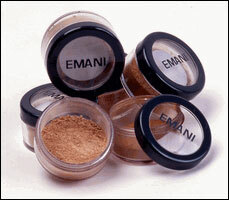 But, Emani has very affordable prices attached to their products.